This was a meeting that invoked memories of movements past for me. I lifted my phone above heads trying to capture the scale of the meeting in a photo, so that I could upload it to social media. A voice next to me piped up “sorry mate, but what ‘hashtag’ are you using for this meeting?” Perhaps a reminder that while this campaign is rooted in timeless principles of social justice, its followers are of a very modern vintage. Something special is happening in British Politics. Let’s give credit where it is due and acknowledge it’s origins as being in Scotland. In May the Scottish Nationalists, campaigning on an unashamedly left wing manifesto, swept a timid and vacuous Labour Party aside. We have only come to realise how far to the right ‘New Labour’ had gone when we heard people referring to Ed Milliband as “too left wing”. Armed with this strange logic, it is maybe understandable that the Party decided it need to move even further to the right. Today’s labour spin teams are chasing an ever diminishing demographic who actually elect the government these days. Instead of going after the 76% who don’t actually subscribe to austerity, are totally disillusioned with politics and don’t bother to vote, they are are trying to convince a rump to choose between different shades of capitalism. That’s not actually what the majority of us want. 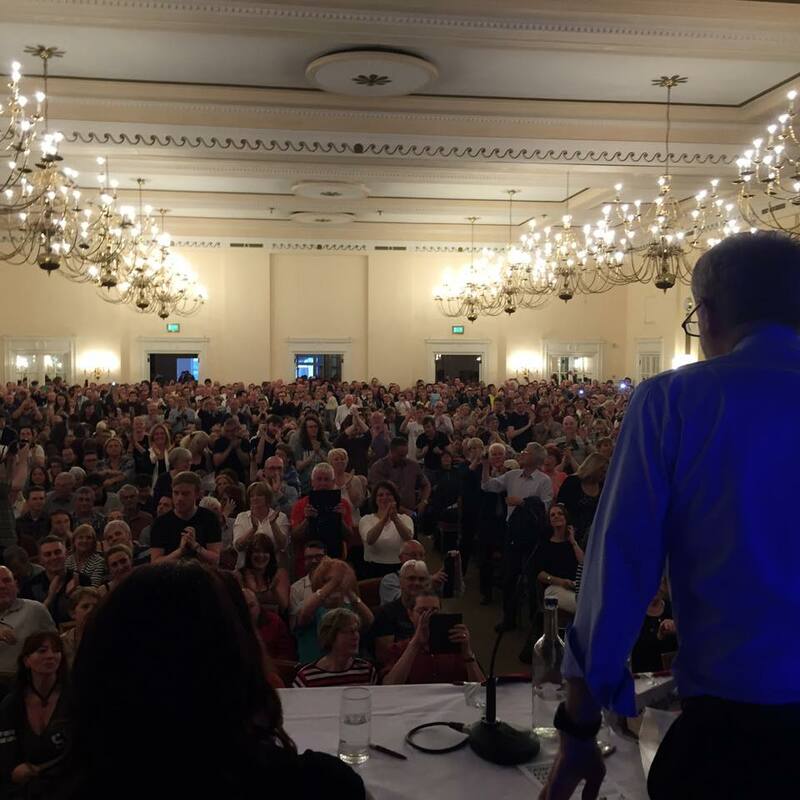 At the meeting last night there was thunderous applause as speaker after speaker called for Labour to once again become a genuine socialist movement that campaigns for an end to austerity, a Government that redistributes wealth and creates a fairer society. There were calls to end tuition fees, reverse the privatisation of the health service and for a real living wage. 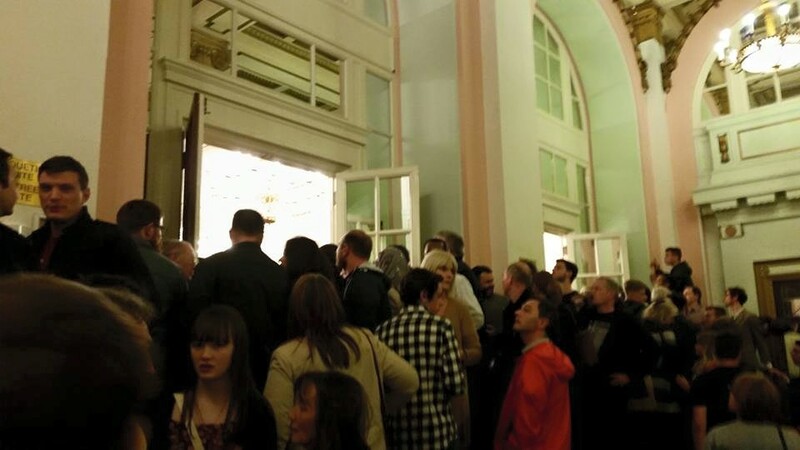 The room its self was packed, with every seat taken and people lining the walls three of four deep. The atmosphere was electric. I remembered similar meetings of the past, the sense of anticipation, the feeling of unity and common purpose and the belief you are part of something much bigger than yourself. I recall that back then I believed we could change the world and last night I marvelled at how that old feeling was back again, just as powerful and magical as ever. Movements ebb and flow. Sometimes they are vanquished, but ideas never go away. They just lie in wait for their time to come again or for a leader to come along who is articulate enough to espouse them once more. In Jeremy Corbyn we have found that leader and as he took to the platform a great roar filled the room. This was the man we had come to see. I get the sense that Corbyn is a modest man. He sees himself as a democratic leader. He listens and wants to encourage discussion and debate around ideas in the party. He believes passionately that the membership and the people have the answers; they just don’t realise it. It is a refreshing change. Gone are lectures about ideas being unelectable. We are no longer being told that our aspirations are outdated or discredited. Instead we are being encouraged to discuss, explore and debate thoughts and ideas. At long last there is a voice within the movement who is setting out a vision for a just, more equal and fairer society, asking why not? and encouraging us to think about how we can achieve it. No longer are we being told to accept the status-quo and it feels truly liberating. Corbyn spoke passionately about his vision for Britain. On education, he argued it’s not an individual privilege that should be taxed. When schools produce doctors, engineers and teachers we all benefit. We should fund education as a right and that includes continuing adult education. He spoke of how students are being punished for working hard at University, only to be rewarded with tens of thousands of pounds worth of debt and vowed to end tuition fees by raising corporation tax by 0.5% to pay for a return to grants. In sharp contrast with Cameron’s response to the migrant crisis in Calais, Jeremy articulated a more humane vision. “When people are desperate they do desperate things, but they are human beings. Wouldn’t you rather live in a world where, instead of vilifying these people, we hold out our hands and help them.” Rapturous applause. He spoke of his anger at a grotesquely unequal society that saw people sleeping rough, families depending on food banks while we spend billions on weapons of mass destruction and wealth is concentrated in the hands of the few. “I want a society where everyone helps everyone else and we all care for each other, That’s the whole point of the welfare state, that’s the vision behind the health service. Nobody should fall into destitution.” Cheers and more applause. Moreover he argued, this is not about some ideological fantasy. A society based on peace and social justice is a happier, and more productive society “You can call it humanism, humanitarianism or anything you like. I call it socialism”. The room erupts in approval. A new movement has been born. It started north of the border and found it’s expression in votes for the nationalists, but it has embraced the Labour movement north and south of the border now. Whatever the result of this election, the left has once again found its voice and is more confident than ever before. The party has been transformed and the Blairite entryists must take heed. The membership is growing and they will be heard. To those on the sidelines, I can offer you some wise words. They’re not mine. They’re not even Jeremy Corbyn’s. Instead they belong to that wide eyed 28 ear old who stood with me last night and who had just joined the Labour Party so he could vote for Corbyn. “The only way to make this happen, the only way to influence things and create a better world is to get involved.” I couldn’t have put it any better. Join us.